Artexing is used as a decorative feature for your home’s interior. 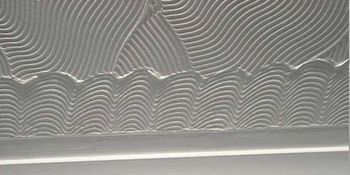 It’s often used on the ceiling and allows a number of patterns to be imprinted to create a unique aesthetic appeal. As an investment, your home is likely to be the biggest one you’ll ever make. Therefore, it’s very important to provide it with a decorative inside that looks great and will make the most of your rooms. For the walls and ceilings there’s nothing that can match the quality appeal of artexing and professionals can create a look that you’ll be proud of. What’s more, artexing your walls can be done at a low cost, providing a wonderful finish which can be repainted whenever a freshen up is needed. If you’re interested in having your walls or ceilings artexed to create a stunning finish in your home, you’ve come to the right place. By completing our quick form you’ll receive up to four FREE quotes from local, vetted and reputable specialists. Project: We have an Artex ceiling in our kitchen and need an area added with Artex where strip lighting was previously if possible please? Project: Artexing average size living room ceiling and small kitchen ceiling. Project: To Artex bedroom ceiling in ex council house, 3 cracks in ceiling to be taped over then stipple effect wanted. For sons house. Project: We have a fan patterned artex ceiling that has sustained some water damage due to a leak from out power shower pump in the airing cupboard above. We would like to get this repaired. Project: shower room ceiling of about 3 square metres - existing smooth surface with cracks. Project: I have a 3'6 square hole in my ceiling, I have fitted a piece of plaster board, I now need somebody to copy the artex pattern. Project: Artex two ceilings within home.